SU1000 6850. Silbury Hill is a man-made chalk and clay mound beside the A4 road 1 mile south-east of Beckhampton. It dates from the Neolithic period of prehistory some 4,700 years ago. This famous conical-shaped hill is 130 feet high or 40 metres and, with its wide outer circular ditch, which is most noticeable at the eastern side and quite often filled with water in wet spells of weather, it covers a total area of about 5 acres (2 hectares). The base of the hill covers 167 metres, while the flat-topped surface is about 100 feet in diameter. The first phase of building here began in 2,500 BC followed by, perhaps, another three phases of work; thousands of local workers were employed in the construction of the mound which was built in the form of a pyramid in steps or tiers – the steps being cut sarsen stones from nearby quarries. Then these steps were filled in with more chalk and clay and then levelled off and fashioned in to what we see today, an almost circular smooth-sided mound. Silbury Hill by William Stukeley. Archaeological excavations have taken place at Silbury in 1776, 1849, 1968-70 but nothing of any great interest has ever been found, certainly no sign of any burials. 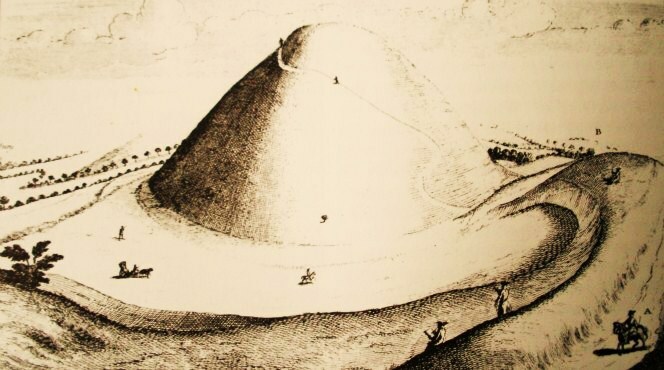 Historians and archaeologists have mused over what the hill was used for for a long time but no one has been able to come up with anything special. It could have been used for astronomical purposes or perhaps as an ancient sundial or something else. The Romans are also likely to have used the hill as a look-out post when they were marching along their road, now the A4. 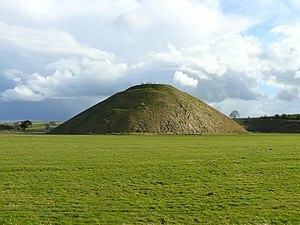 According to legend, Silbury Hill was the burial place of King Sil. He was apparently buried inside the mound wearing his gold armour and seated on top of a golden horse or, the devil had a hand in the building of the mound by tossing a shovel full of earth away while building the Wansdyke; or he was aiming at the town of Marlborough and a bit of earth dropped from his shovel in the process. There are a number of other legends but none hold much credance. The area around the hill is quite literally covered with round barrows, earthworks, and ancient sites. Half a mile to the south-east is the West Kennett Long Barrow and the famous Avebury stone circle is only a couple of miles to the north. Together they form a sort of ancient complex, many standing on ley-lines and alignments that intersect and pass through each other, as if that’s what they were meant to do and no doubt to the ancient peoples that’s what they did. The stone Age people were well aware of alignments, they knew a thing or two about them. Categories: Artificial / Man Made Mounds, Silbury Hill | Tags: Silbury Hill near Beckhampton in Wiltshire | Permalink.